Introducing the Robinson R44 Raven II, the latest derivative of the very successful and proven R44 helicopter line. The Robsinson R44 Raven II is equipped with a fuel-injected, angle-valve, tuned-induction, IO-540 Lycoming engine which produces substantially more power and gives the Raven II greater altitude performance, more payload, and increased speed. The Robinson R44 Raven II configuration is also available as an IFR Trainer, Newscopter, Police Helicopter, and Clipper II. The new fuel-injected engine provides higher power for better performance and eliminates the need for carburetor heat. The engine is derated to 245 HP for 5 minutes and 205 HP maximum continuous rating, to assure a longer life and lower cost of maintenance. Overall, the Robinson Raven II provides a favorable 100 lb increase in the R44’s gross weight and increased IGE and OGE hover ceilings, while eliminating the carburetor and carburetor icing problems. 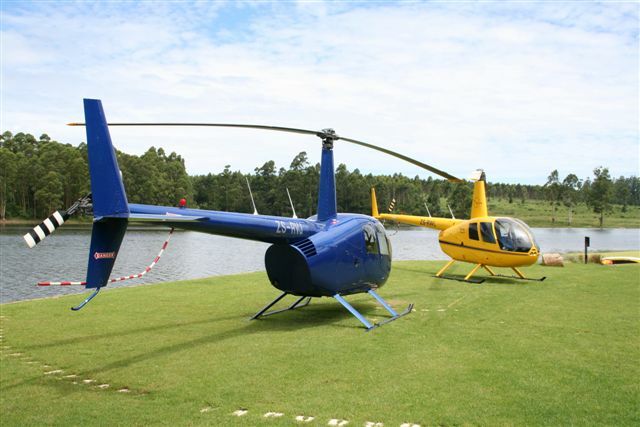 Main rotor blades have greater effective lifting area which reduces vibration. Main and tail blades have new aerodynamic tip caps which reduce the 500-foot flyover noise level by nearly one decibel, despite the higher gross weight.